The title above is a frequent caption we “mark” on many of our gallery photos and use in some of our marketing material. But, its more than a cliche or marketing gimmick – it is a guiding mindset of our business. We know we’ve achieved this when we see the excitement and satisfaction in our clients as their projects come to life. Seeing that excitement and satisfaction is the most rewarding aspect of this business. Archadeck’s tradition and proven business practices are very key factors in our successes. The “fine art of outdoor design” is another. When those factors mesh, beautiful things happen, as you can see in photo galleries of the various Archadeck offices across North America. Within our Archadeck franchise system of over 50 Archadeck offices, we traditionally recognize individual offices for excellence in design. These acknowledgements are rewarding, too, because it is recognition from our peers, whom we come to have the utmost respect for. 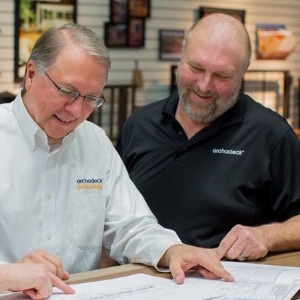 The support network we have in the Archadeck system is anchored by peer networking opportunities our franchisor, Outdoor Living Brands, Inc., has created under the Archadeck brand. We support each other. We push each other. We cheer each other. All in an effort to make each of us successful and more successful as a whole than individually. So, when any of us receive recognition for design excellence from our peers, its an honor as much as it is a reward. Prior to 2015, design excellence recognition within our Archadeck system was mostly an internal affair. But, beginning in 2015, the award structure was re-charged and made more public…and exciting…and competitive (in a fun way). Office entries to project categories (decks; patios and hardscapes; porches and rooms) are submitted and announced quarterly with each of the 3 quarterly category winning projects (12 total) qualifying for an annual, grand prize winning honor. The grand prize award winning project is announced at our annual franchise system meeting and is subsequently featured in our Design Guide, on a special Design Excellence Award Winners page on our national web site and promoted thru various national press releases. 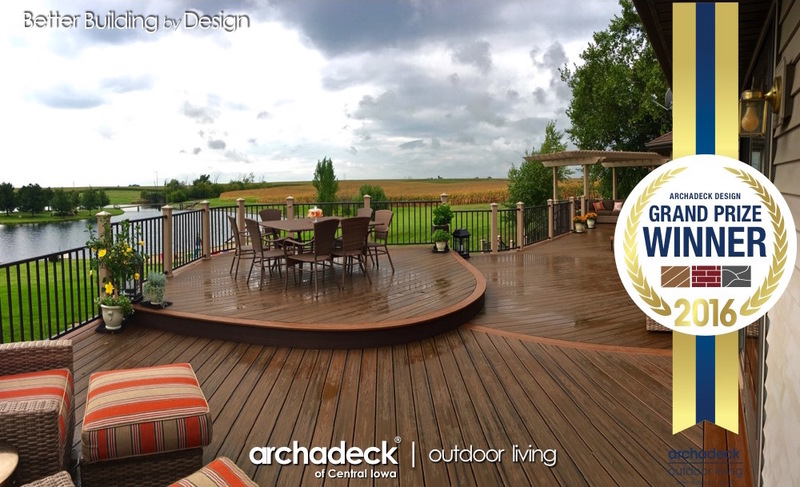 At our annual franchise system meeting in January 2017, the Archadeck of Central Iowa deck project above was announced as the national Archadeck Design Excellence Grand Prize Winner for 2016. Click the photo (or other links in this paragraph) to learn more about the project at the photo gallery for this award-winning project. We are humbly honored for this recognition of design excellence. 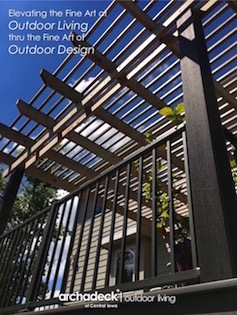 The Archadeck system designed and built over 2,000 outdoor living projects in 2016. 12 of those projects won quarterly, category awards. Our deck project – in a beautiful, rural, setting east of Des Moines – was selected as the most excellent of all the excellent projects. By our peers. Peers we wouldn’t be doing this without. Peers we owe much gratitude. 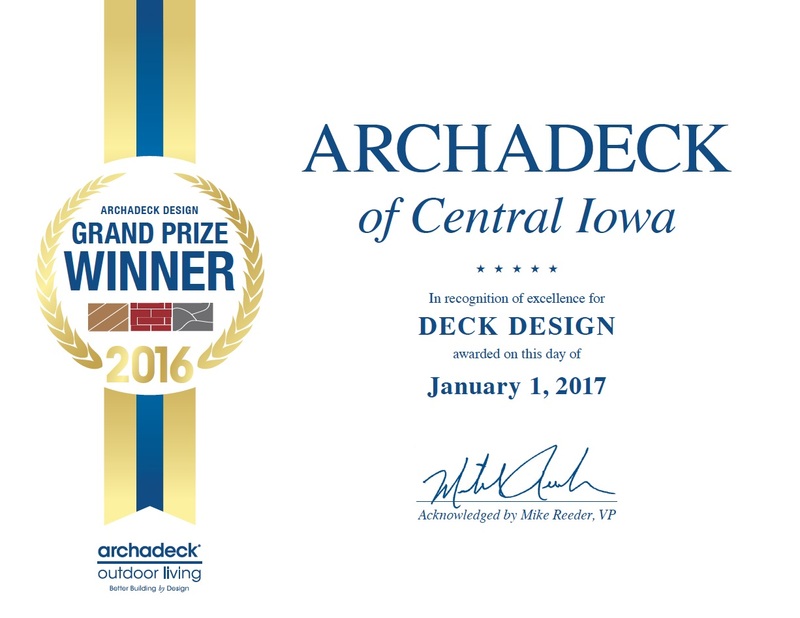 Archadeck of Central Iowa is honored to have been acknowledged for several other Archadeck design excellence awards over the years as well. These outdoor living projects are listed below and include links that when clicked will take you to photos of the projects scattered throughout our photo galleries here. Some of these projects – as well as others – have also been frequently featured in local – and even national – publications. More information about these projects can be found at the Special Media Features section in the “About Us” menu tab above.